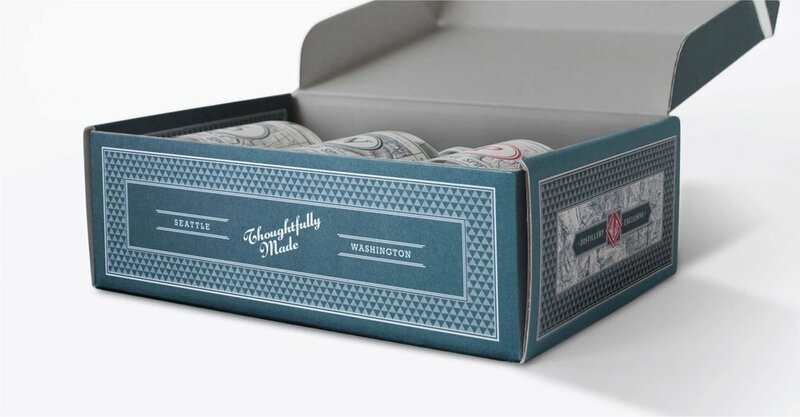 WESTLAND DISTILLERY | CREATIVE RETAIL PACKAGING, INC.
Seattle-based Westland Distillery specializes in the artisan craft of distilling American Single Malt Whiskey. Each unique flavor profile is inspired by the natural resources provided by the Pacific Northwest, primarily American peat from local wetlands. When it came time to open their Seattle distillery, they reached out to CRP as a fellow PNW vendor to develop a retail box for a trio of whiskey bottles. CRP created a container and insert that was structurally sound enough to house the three bottles of spirits in place without breakage, while having them displayed horizontally. Working to maintain the look and feel of the brand, we utilized a combination of corrugate and a laminated white paper stock to give it a rough, yet refined feel. The specialized lamination process presented initial challenges due to extreme temperature exposure throughout the operations process, however, CRP worked directly with the factory to develop a solution that achieved the fine print quality without compromising the structural integrity. The resulting package was a success for Westland Distillery, who has since been named the “2015 Whiskey of the Year” by the American Distilling Institute and won the title “2015 Craft Whiskey of the Year” at the San Francisco World Spirits Competition.